I'll be teaching a guided knitting meditation twice this April. Once here and again here. Fast forward to a few years ago and I started reading up on establishing a meditation practice. I've gone to some guided meditations and found more on YouTube that I could do at home. Attaining a daily practice can be challenging in a busy life which lead me to trying a variety of types of meditation. Some of those focus simple mindfulness during daily life. In an online survey of knitters, conducted by a knitting therapist, Betsan Corkhill, reported that knitting left them feeling "very happy." Many knitters said that they did so, purely for the relaxation, stress relief and opportunity to be creative. Using knitting to achieve a meditative state of mind often happens as a natural side-effect of the process. In preparing to give the guided meditation I've just finished reading Mindful Knitting by Tara Jon Manning. 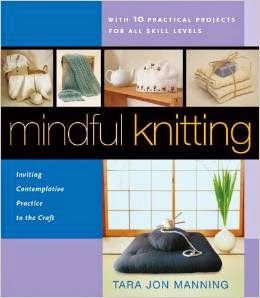 If you are interested in trying a knitting meditation on your own this would be an excellent place to start.